Dog training adult dogs is not easy but check out this page and learn if old dogs can really learn new tricks! 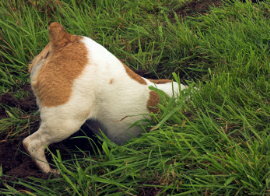 Habitual digging will require "retraining" of this dog. Unlike puppy training, dog training an adult dog comes with a new set of challenges! Mature, or adult dogs to this point have learned behaviors and pretty much are set in their ways. Many dogs are not raised with proper training, may be left outside, fenced and basically learn on their own.While this is not necessarily a problem, when dog training an adult with behavior issues we must help them "unlearn" poor habits and "retrain" those that are desired. Certain dogs develop problem behavior. Take a look at dog pounds or do a quick Google search on "dog rescue", bet there' hundreds if not thousands of results listed. The fact that so many dogs are given up is highly attributed to poor behavior. Dog training with adult dogs can be a little more trying yet is never impossible. Of course problem behavior and bad habits such as anxiety, fear and aggression will require more specific dog behavior and training techniques that are somewhat more complicated. 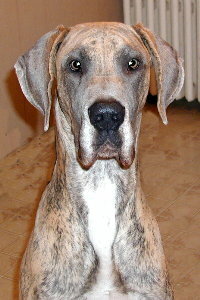 With adult dogs temperament can vary greatly by breed. If you raised the dog yourself this is beneficial in that you are aware of its history. Those that adopted or homed an adult dog should do their best to contact past owner or rescue group and get as much history as possible about their furry dependent. As a dog ages they may naturally become more protective and wary of new situations, especially if they were not properly socialized. Doggy habits develop that can interfere with focus and make dog training more difficult. Perhaps you have a decent dog who's just a bit rough around the edges and you want to train obedience, or new tricks. Many minor issues such as pulling on walks, nuisance barking and digging are common. Many of these issues can be resolved relatively easily with dog training. Dog walks will stimulate the mind and ease anxiety. A pent up bored dog can turn its attention to all sorts of bad habits. 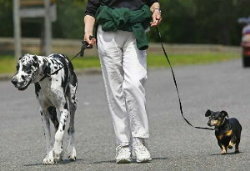 A good structured walk twice a day is the foundation for successful dog training. This also allows a dog to explore offering an excellent opportunity to socialize and eases stress. If you are unable to walk your dog, an hour or so of playtime in the back yard will do just fine. Yet the opportunity to socialize will be lost. TIP: Geek your dogs history! It's important to acquire behavior history If you're homing a new adult dog. Most reputable rescue groups will evaluate behavior and adopt out appropriately. However, you may find your new dog may lack in certain aspects and these are the points we need to address. Maintain socialization, structure and exercise life long as dogs never stop learning. Don't let things get boring or stale, always try to introduce new people, pets and situations to keep your dog's mind stimulated. Failure to keep up with socialization can lead to boredom and a bored dog is more likely to act out, become fearful, aggressive, or develop other serious behavioral problems. Socializing is not difficult and is one of the most important things in assuring a trustworthy canine good citizen, don't take it lightly. Adult dogs can always be trained and if you're up for a challenge, can learn..
Obedience and rally style obedience. therapy work, guide dog training, canine good citizen CGC. Canine freestyle dancing, tracking, schutzhund and personal protection. search and rescue, seeing eye, bird and hunting sports. Narcotics work, police work, service dog work, herding and more! 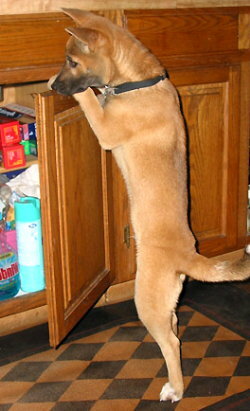 This dog has a counter surfing habit and is clever to wait until there's no supervision. Some common problems seen in adult dogs are pulling on leash, jumping up on people, excessive barking, marking, eliminating in the house, digging, aggression, timidness and fear. It's not at all uncommon for a dog that was well socialized as a puppy, even tempered and friendly, can begin to react differently during social encounters as an adult. In many cases there are no traumatic experiences to explain this. Signs of fearful or aggressive behavior can crop up in certain breeds without warning as they mature and this is typically noticed about 1 to 2-years of age. Don't let up on socialization at this point, keep it up as this is a very important stage in development of your dogs behavior. Anxiety and boredom can provoke bad behavior and mischief when your dog is left unsupervised. Bathroom habits can change on occasion as well. This can be do to environment, marking, new pets, family members, stress, age, illness and more. If your dog begins to forget where the bathroom is, or starts to conveniently go wherever he/ she feels like it. This can be a more complex issue, please read our article on adult dog potty training. An example, dealing with fear..
Say for instance your dog shows anxiety, fear or aggression towards your UPS delivery man. Concentrating on socializing and desensitizing encounters with the UPS driver would be top priority. Grab a friend or family member, dress them in brown, have them approach with a box and ring the bell. Answer the door with a confident calm demeanor projecting you are in charge. Command a sit and DO NOT open the door until your dog sits. Once this happens praise and reward. If your dog gets up while you're opening the door, close it! You get the picture, now repeat, repeat, repeat. Most social situations can be handled in similar fashion. It's not about punishing for bad behavior, it's more about praising for desired action. Fear and Aggression comes in many shapes and forms and can be quite complex. Ironically, both behaviors are somewhat related. Briefly, I will summarize here and further discuss the different aspects of these behaviors with future detailed full page articles. One of my dogs "Koda" in a "sit-stay" focused and awaiting a reward. When addressing fear and aggression, reward based dog training is best. Fearful dogs can typically be introduced to new people with a treat/ reward. Canines are amazingly food driven and in many fearful dogs this method works wonderful. This can be a slow process and literally take a baby step approach. Imagine you are training a wild Squirrel to come up on your deck and take a peanut from your hand. In many cases it can seem that methodical. Here we are using treats/ food as a "lure". Fear and anxiety often go hand in hand. Our goal here is by using our lure, to achieve a trust and bond with a fearful dog. Aggression on the other hand is more directly related to poor socialization. Yet a fear aggressive behavior can result as well, especially when a fearful dog is cornered or does not have the means to escape. Further, un neutered males and un altered females may become aggressive from time to time regardless. Positive reinforcement can be used to address aggression. What's really happening here however is with a lure/ bait/ treat, we are distracting the dog and gaining it's focus prior to an elevated aggressive state of mind. Timing is key and an aggressive dog is usually put into a sit stay, or down stay until the stimuli/ distraction passes. Conversely, many trainers employ the correction reinforcement method for dealing with aggressive dogs. Here and in the same situation, a correction/ command is given to "snap the dog out of it" and gain their focus. Interestingly, it's often an amateur dog handlers action that help feed this aggression in the first place! A handler who is nervous, afraid, or worried about a situation projects lack of confidence. This is quickly picked up by a dog and feeds into the aggressive state of mind. Nervous handlers may pull into a leash and yell at their dog to stop. With repetition this conditions the dog that every time this situation occurs it is supposed to behave this way. The problem with leashes, collars and corrections with aggressive dogs is it associates socializing with negativity. Compared to the concept of praise, reward and pleasure. So it makes sense to try and address aggression in a positive way starting out. For helpful articles on dealing with many of the behavior issues mentioned on this page, don't miss the links provided at our dog behavior and training section.